Unexplained tremors in the earth. World leaders baffled. Scientists scattering to find a solution. People, young and old, terrorized! No, this wasn't a trailer for a new horror movie, but a video game! At the peak of the video game industry in the early '80s, Atari became the first company to have a commercial featured at movie theaters. Among the previews featured before the 1982 film Halloween III, the audience was treated to a two and a half minute ad for Dig Dug. With the approval of Atari, the Young & Rubicam advertising agency incorporated Hollywood professionals to give the feel of a big budget movie preview. Veteran dance and choreographers were also hired for a Dig Dug Band and musical number. In September 2014, a cassette tape was unearthed by Matt Osbourne (the son of a former VP of Marketing for Atari) that featured Chubby Checker's version of the "Dig Dug Dance" that was for some reason never used in the original advertisement. But even though a famous musical artist wasn't used, Y&R hired special effects crew members from Poltergeist to create Dig Dug's digging scenes. 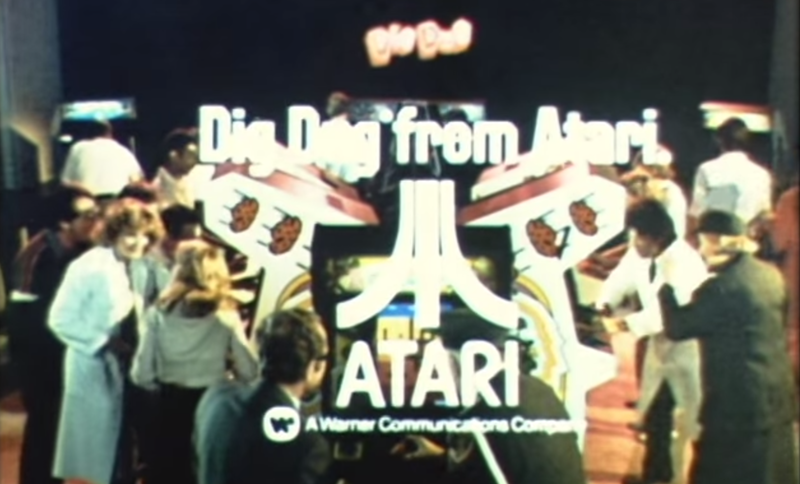 The first theatrical video game advertisement took 5 days to film, including one entire day just to film Dig Dug's video game screen. The result would characterize Atari's big budget advertising leading up to its collapse (and the video game industry as a whole) in the mid '80s. I haven't come up with any information on why Dig Dug was chosen to be the video game featured in the ad. I would speculate the "underground terror" idea was the initial idea and the creative team picked a popular game to fit.